Moisture—in the form of humidity, water spills, or rainfall—spells early demise for cell phones, light-emitting diode (LED) displays, TVs, and solar photovoltaic (PV) panels worldwide. Standing between that nefarious moisture and the device at hand is a transparent film barrier that must work flawlessly year after year, even decade after decade. Now there is a test that can detect infinitesimally small amounts of moisture—and that can therefore give much greater assurance that the barrier films will last. Developed by the Energy Department's National Renewable Energy Laboratory (NREL), the NREL Electric Calcium Test, or e-Ca, uses unique design elements to measure corrosion from water using calcium. Industry durability standards for PV modules call for tests lasting 1,000 hours in damp heat conditions. Module manufacturers want to be assured that any barriers they use will be able to pass the moisture-blocking test, so they can focus on optimizing the rest of the module. And they want to make sure that anything they buy has passed rigorous quality control. The e-Ca method is 100 to 1,000 times more sensitive than other commercial tests designed to detect small amounts of moisture. NREL's test can detect down to 10 to the minus seven, or one ten-millionth of a gram of water per square meter per day. And it has 15 times greater throughput than the best commercial methods on the market today. 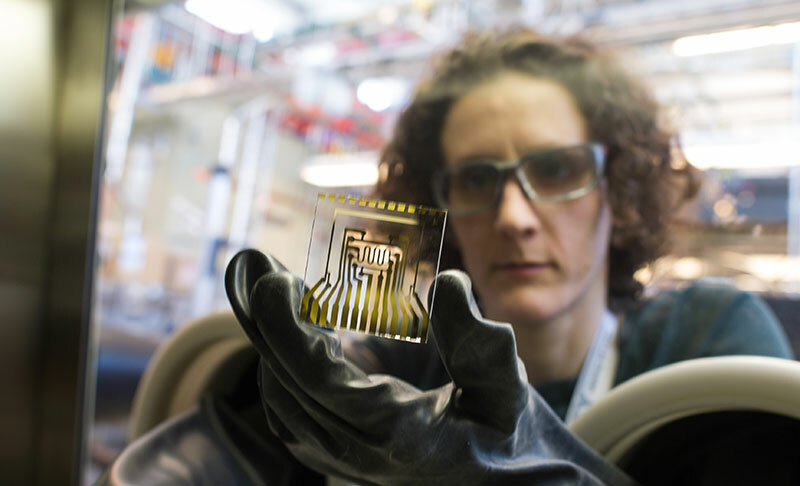 NREL's e-Ca method arrives at a time when the organic light-emitting diode (OLED) market is poised to explode—from $4.9 billion in 2012 for OLED displays to an expected $26 billion by 2018. The method uses low-cost test cards with calcium metal traces that serve as moisture detectors. Any water vapor that passes through the barrier film reacts with the conductive calcium and forms resistive calcium hydroxide. It's that change in resistivity that yields the rate at which the water vapor permeates the film—the water vapor transmission rate, or WVTR. The test cards are made in large batches in a moisture-free environment. When a barrier is ready to measure, it is sealed on one side of a metal donut-shaped 'spacer' element with the test card sealed to the other side. The whole assembly forms a small diffusion cell that can be tested in almost any environment. The spacer also serves as a convenient and reproducible means of adhering and controlling the flow of the edge seal that is used to seal the barrier to the test card, thus assuring that the barrier is the only thing being tested. The assembly then attaches to custom NREL-assembled measurement electronics inside an environmental chamber that delivers a certain combination of heat and humidity. A good climate for testing is 45 degrees Celsius (°C)—113 degrees Fahrenheit (°F)—and 85% humidity, a condition hotter and wetter than even Bangkok, Thailand, on a miserable day. Testing in conditions beyond anything likely to be found in nature allows the test to be completed in less time. Another useful climate for testing is 85% humidity and 85°C, which is equivalent to 185°F and is a required reliability metric for PV manufacturing. Testing at 85°C ensures materials will be able to pass relevant qualification tests, and testing at 45°C gives permeation values relevant to the most severe climates in the world. Five years ago, NREL scientists Arrelaine Dameron and Matthew Reese were both working on projects that required them to either make or research barriers. "We realized we didn't have the means to test in the sensitivity range we needed," said Dameron, who works in NREL's Chemical and Materials Science center. NREL Senior Scientist Michael Kempe, who is part of NREL's PV Reliability group, joined them, and the trio started to devise a user-friendly test that could detect moisture in minuscule quantities. 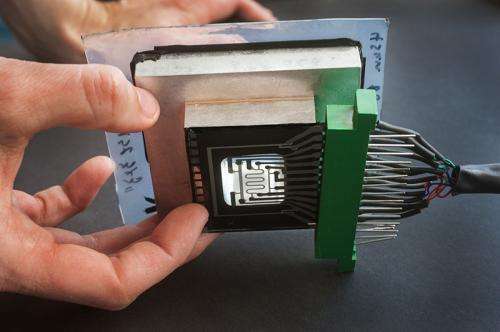 "We started with a test method that had been reported in the literature, but we found that there were a number of ways we wanted to make it better," said Reese, who works at the NREL-based National Center for Photovoltaics. So, the NREL team improved on the method in several key ways. Instead of depositing calcium directly on the barrier, they opted to deposit it on separate test cards. Instead of using one large, unpatterned calcium square, the test cards contain several maze-like ribbons of calcium, allowing both higher initial resistances for each trace (making it easier to measure) and redundancy built into every test card. They also inserted a calcium 'witness' sensor that monitors the integrity of the edge seal. The team tested a large number of materials to find an easily assembled and durable edge seal that could last for months to years at high temperatures. Then, perhaps most critically, they introduced a spacer element that allows them to vary the ratio of the exposed barrier to the calcium sensor area. In previous calcium tests, this was always fixed at a one-to-one ratio. NREL's test can amplify the sensitivity by funneling 100 to 1,000 times more moisture to the moisture-starved calcium sensors, compared to other tests. This is particularly important because even when the moisture is amplified 100 to 1,000 times, the amount of calcium consumption that is ultimately sensed when testing extremely good barriers can be as small as a fraction of an atomic layer per day. Key to the test's sensitivity is a four-point connection—two wires to send current through the calcium resistor, and two more wires to measure the voltage. This technique removes the effects of leads and contacts so that tiny changes in resistance can be measured more confidently. 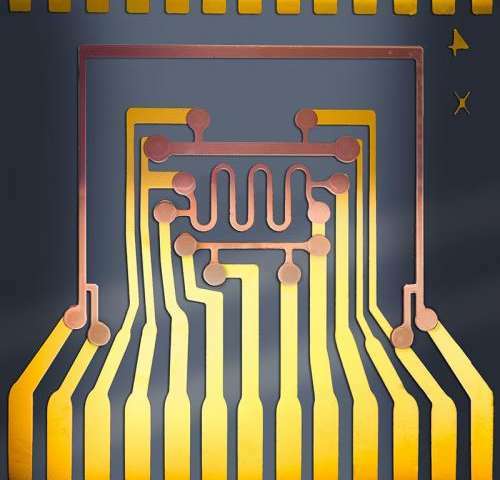 The four-wire connection to the outside world is made by gold traces because they are insensitive to moisture. Even though the cards use tiny amounts of precious metals and require careful protection in a moisture-free environment, they can be produced for such low prices that they can be discarded at the end of each test. Bringing all these innovations together allows NREL's test to beatoday's commercial apparatuses that measure WVTR in both sensitivity and throughput. At best, a standard commercial system can get to a WVTR sensitivity of 50 parts per million. However, developers of flexible electronic devices such as OLEDs, organic PV, and other thin-film technologies need a sensitivity of less than one part per million to ensure investors that their money is going to products that will last. The NREL test reaches that sensitivity and works for film barriers for all kinds of devices—copper indium gallium diselenide (CIGS) PV cells; flexible stainless steel foils that can be glued to a roof; outdoor LEDs; and, of course, nearly all new TVs and cell phones. Barriers used today are made on rolls about a meter wide and potentially miles long. The goal might be to keep out moisture to the tune of one one-thousandth of a gram per day. To assure against imperfections, a barrier manufacturer may want to design the film to be 100 times more water resistant than that. Quality control can be performed by testing a few samples at, say, mile one, and another few at mile two, and so forth. Manufacturers can be assured that if those samples pass muster, then the entire batch is very unlikely to include any stretches that fail to seal at the 100-times-lower threshold. "It's designed to ensure that the process is robust," Kempe said. "When the tests are done, you can say that the material is good, that the variability is this much, and that there's maybe one chance in a million that this barrier will fail." If the barriers had to be tested one at a time, the tests would be prohibitively expensive, requiring the use of multiple testing stations to keep up with demand. Previous technology could test just a couple samples a week. The NREL scientists devised a way to test 128 barriers simultaneously, a significant increase in throughput. A barrier of 10 to the minus four—four to five more orders of magnitude than the moisture protection required for food packaging—is the minimum threshold at which the material starts to provide protection for 20 years. Even at this level, after 20 years, a device accumulates a layer of water almost a micron thick. This can be catastrophic if the electronic materials that are being protected are themselves about the same thickness. Ten to the minus seven is 1,000 times better. "When you design something, you want everything to work perfectly—you don't want it to just barely squeeze by," Reese said. "You want to give yourself an extra factor of 10, and then you can be much more confident." This helps explain why the measurement is so complex. Even with the amplification NREL's spacers provide, at 10 to the minus seven, just one one-hundredth of a nanometer of calcium would be consumed per day. "The overall aim is to be able to measure very low permeation rates over a long period of time with multiple samples, and to do it economically," said Kempe. NREL is ready to license the e-Ca technology to deposition equipment manufacturers that make barriers by the mile, or perhaps to universities. Film-barrier testing "is an important part of a very large market," Reese said. "It's a very enabling technology. Without the ability to measure the barriers, it's much more difficult to control them and to be able to say that your product is better than someone else's product." OLEDs are being hailed as the future for displays in devices such as TVs, computer monitors, and cell phones. OLEDs produce a better quality of light than traditional LEDs and can be molded into any shape, while saving some 90% of the energy used to power incandescent lights. The Energy Department has shown its commitment to OLEDs with $40 million in funding for R&DPDF. NREL's moisture-permeation test method can provide the assurance that barrier films passing the WVTR test can be counted on to keep out damaging water month after month, year after year. "We have devised a way to constantly monitor an infinitesimally small change in water presence," Dameron said. "We can do it reproducibly by integrating a user-friendly assembly process, and we can do it for many samples simultaneously. This is what makes our test unique."